Looking for Bundeena Skip Bin hire or Maianbar Skip bin hire? Long established as the leading skip bin supplier in these beautiful seaside villages is MCM Skip Bins. We are proud of our reputation for delivering every Bundeena and Maianbar customer fast and easy skip bin hire, competitive prices and unbeatable service. All since 2003! Our already well established name sees us in and out of the Royal National Park delivering skip bins to Bundeena and Maianbar several times per week with no delivery fees. This is why we have a variety of skip bin sizes to suit your waste removal job. 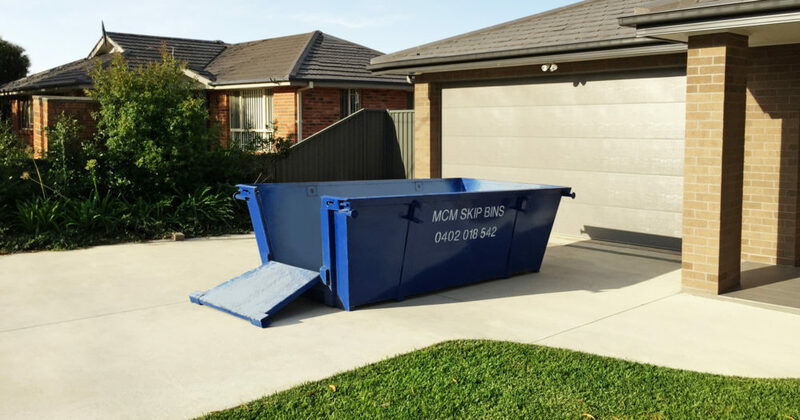 Bundeena skip bin hire includes skips from 3 -4 cubic metres for clean outs, small renovations or a quick move. Our larger bins in 6 and 8 cubic metres are excellent for a big spring clean, larger renovations, site clean-ups or removal of demolition. Our expertise with over 10 years in the industry allows us to ask all the right questions to determine the right size for you. Yes we agree. Our landfills are under a lot of pressure with all the waste we add to them each year. We want you to know that we think it’s important to do our part and take care of the environment in the ways offered to us through this industry. We take our time with each skip bin to sort out materials that can be recycled to minimise the negative impact that waste has on the environment. We believe that residents, trades and business owners in Bundeena should have fast, easy access to affordable Bundeena skip bin hire when they need them most. We work hard to offer the best rates possible, so you can feel confident in your local provider. Bundeena is a stunning seaside village located deep in the heart of the Royal National Park looking over the Port Hacking River and township of Cronulla in the Sutherland Shire. Bundeena is known for its passionate art community, environmentalists and quiet lifestyle. Bundeena is quickly becoming known for showcasing some of Sydney’s best coastal architecture. Access to some of the building sites situated on sandstone cliff tops is only for the well experienced trades and skip bin drivers. You can take Sir Bertram Drive through the Royal National Park or enjoy a short ferry ride from Gunnamatta Wharf in Cronulla to the centre of Bundeena (no ferry for us unfortunately). The town is proud of its strong sense of community Bundeena Primary School, Bundeena Bowling Club and the recently opened Bundeena Community and Services Club together with Bundeena Pre School, parks, sports clubs and more.